Many people consider California to be the land of the endless summer. While this is true most of the time, there are differences once summer actually hits. For example, there are numerous summer date night ideas that you can only do when it is officially summertime in Los Angeles. As the lazy, beachy, summer days are quickly approaching, we’ve rounded up the best activities to do this summer. You can totally do these with your BFF, you lover, or by yourself! Summer loving will definitely be a blast if you use this guide to live it up in the City of Angels…trust us. Ever wanted to watch a movie in a cemetery full of Hollywood’s biggest (and er, dead) stars? Well, that’s exactly what Cinespia is all about. 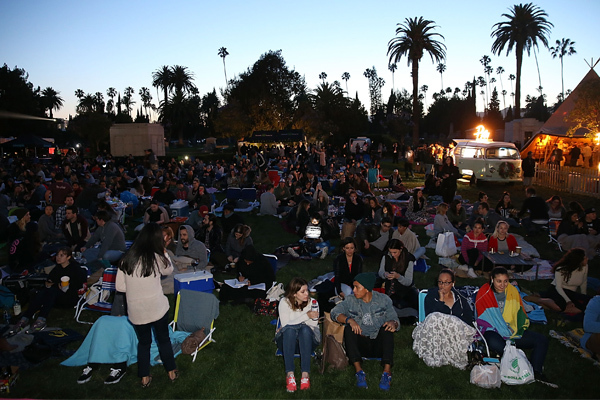 Throughout the year, this company does have a few showings around L.A., but when summer hits (May 13th to be exact), it’s all about the cemetery showings — located at Hollywood Forever Cemetery. Every month new movies go on sale, and all you have to do is buy them online and grab your bae or your bff. We also recommend bringing blankets and a picnic — wine included — to dine on as you sit amongst the tombstones. Usually, when you hear First Fridays in L.A. it means food trucks and dive bars — which is great — but this is a different take on that. From now until June, the Natural History Museum does their own spin on this tradition. They have DJs and musical guests, as well as science talks, museum tours, and late night dinosaur adventures…with cocktails. If live music is your thing, this one is for you. On Saturdays throughout the summer months, Getty Center is host to some pretty cool concerts. They have under the radar musical groups headlining, which you can watch in between visiting the museum, watching the sunset, and eating. The best part is the events are free! All you need is cash for any cocktails or food you might want to purchase throughout the night. Baseball season kicked off in April, but what’s a summer date night without a little baseball? It is a definite must-do for any Los Angeleno. Even if you’re not a big sports fan, Dodger Stadium — home of the L.A. Dodgers — is “Blue Heaven on Earth” and a fun place to be. The food is awesome — try the Dodger Dog — and you can get soft serve in a baseball cap. What’s not to love? Whether you’re a Romeo & Juliet fan or more of a Taming of the Shrew play-goer, this is a really cool summer activity. Shakespeare by the Sea (SBTS) is a nonprofit organization that performs all over Los Angeles and Orange County. This summer they will be performing Macbeth and Taming of the Shrew! Note, all of the performances are free, so there is no excuse not to take in some of the best plays ever written with your loved one. If you want another movie-going option, this is it. Rooftop Cinema Club is all about watching movies on the rooftop of The Montalban in comfy chairs, with headphones, and an amazing view of Hollywood. It is where movies all began, so why not watch a few here this season? Plus, there is now a “Rooftop Love Seat” chair situation that you can use to cuddle with your bae. It wouldn’t be summer in California without getting some rays and hitting the beach. The most stylish way to do this? Attending the gorgeous Annenberg Beach Club. It is open to the public, has a rec room for games — aka ping pong — and, of course, a pool. There are also beach volleyball courts, a cafe, and paddle board rentals. For a more romantic setting check out the sunset swim, which is for adults only, on the second Friday of each month. The Hollywood Bowl is one of the best venues to see a concert in all of Los Angeles. What makes it even better is that during the summer, you can picnic at tables surrounding the venue. If that isn’t awesome enough, you can pre-order a picnic box to eat at the areas or at your seats. Oh, and you can bring your own bottle of wine to almost every show. Sounds like the ideal date night to us. This is pretty much any food lover’s dream come true. Every summer, 626 Night Market pops up at Santa Anita Park’s Paddock Gardens. It features the largest Asian food markets in all of America and you can try it all. There are a TON of vendors, live music, drinks, games and more. Check out the schedule here and come hungry! Starting July 7, everyone’s favorite summer concert series is back! Every Thursday there is a free concert near the Santa Monica pier on the sand. You can bring any tasty food and drinks you’d like, and of course a blanket. It’s romantic, fun, and totally summer approved. Malibu Wines isn’t exactly seasonal, but it is better with warmer weather. Grab your crew and head to Malibu for the ultimate wine day. You can also go on their safari and see wildlife while drinking, which is a great date idea. Oh, and there are occasional days during the week where movies and wine is an option. Check out their calendar for more wine-induced fun here. The L.A. County Fair is a total must to end your summer date nights. This year it will take place from September 1 through September 24. Before you say goodbye to summer, you should definitely check out the fair for deep-fried anything, carnival rides, and of course epic concerts. PS: We highly recommend doing a happy hour rooftop bar tour throughout the summer. It’s SO L.A.